The victories Golf Road Warriors drove into town last night and made camp at the luxurious Mar Hall Hotel. The Scottish weather had thrown everything at us, rain, hailstones, sleet, driving rain, with a bit of sunshine thrown in along the way, but we stand undefeated, with only the Earl of Mar Course to surrender to this group of vagabonds from around the globe (Well, England, Scotland, Canada and the US to be precise). After one of the best meals of the tour had been served and vanquished and a good nights sleep tucked under our belts, it was with a happy heart to see the sun pecking through the massive windows of my room. I say room loosely, as you could play a five-a-side football match in the place its that big, the bed couple probably sleep all ten players comfortably! After a hearty breakfast we hit the first tee and the warriors were doing their thing once more, this time without the fantastic Sun Mountain rain gear or wind cheater, it was like we had been given a new lease of life. 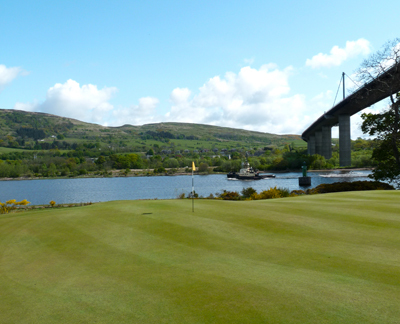 When we got to the third hole and approached our tee shots, we all stopped and took in the fantastic view of the Clyde. 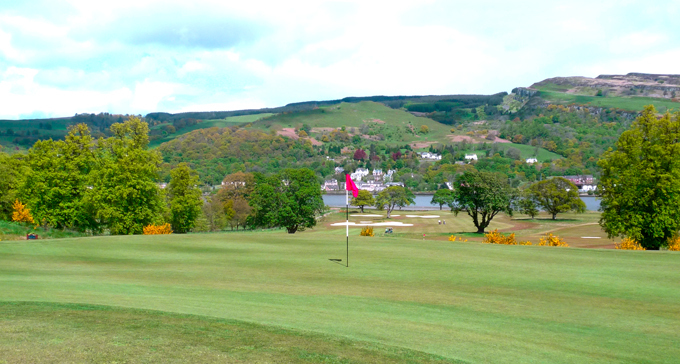 I have to say its an impressive hole, with the River Clyde and Old Kilpatrick hills as its backdrop and the Erskine bridge that transcends it to the right. It makes for a dramatic view, especially with the boats bobbing along the water. The fourteenth is the signature hole and you can see why, it has a high tee, again with the River Clyde as a backdrop, the bunkering and a tree make for the perfect sculptured hole, I am sure many a photo will be taken there. The course is only two years old and you can see its still bedding in. It’s totally different to the major courses that you will play here and its not trying to compete with them. Mar Hall is only four miles from Glasgow airport and is the perfect place to stay on the first or last night of your Scottish golf tour. It offers great food, fantastic accommodation, with well-appointed rooms that would befit a stately home. Then there are the spa and leisure facilities. Now I didn’t use the pool or gym, but I did get to sample the spa and I am so glad I did. My Masseuse Linzi Fleming is an angle, her hands could sooth the body and mind of a Greek Politian. I have golfed every day for seven days sometimes 36-holes in a day, in every kind of weather that god could throw at us. I love my job and wouldn’t change it for the world, but my body, feet and mind had aches and pains that even I haven’t felt before. But she entered the room bathed my feet, then proceeded to slowly take away all those little aches and pains, leaving me totally refreshed and ready for my next Golf Road Warriors trip.